Alexandria, Va. (Feb. 12, 2014) – Thomas J. Gentzel, Executive Director of the National School Boards Association (NSBA), and Daniel A. Domenech, Executive Director of AASA, The School Superintendents Association, issued a joint statement today in response to new legislation introduced by Sen. Tom Harkin (D-Iowa), Chairman, U.S. Senate Health, Education, Labor, and Pensions (HELP) Committee. The new bill would reduce the authority of states and local school districts to decide the appropriate use of restraint and seclusion in public schools. Restraint and seclusion are used as a last resort in situations that may endanger the safety and welfare of students, teachers and other school personnel. Alexandria, Va. (Feb. 10, 2014) – Thousands of school board members, administrators, and educators will convene in New Orleans to take part in the National School Boards Association's (NSBA) 74th Annual Conference, April 5-7, 2014. The theme of this year’s conference is “Transforming Leadership,” and will focus on inspiring and equipping school leaders to become agents of change in their districts toward creating more dynamic and empowering public schools across the country. Alexandria, Va. (Feb. 4, 2014)—Working with two state school boards associations(California and Kentucky), the National School Boards Association (NSBA) has signed on to amicus briefs in cases (Tustin Unified School District v. K.M. and Poway Unified School District v. D.H) that would impact school districts’ ability to provide special education services to students. Washington (Feb. 3, 2014) – U.S. House of Representatives members, Aaron Schock of Illinois, Patrick Meehan of Pennsylvania, and Ron Kind of Wisconsin, were honored this afternoon with the Congressional Special Recognition Award, given by the National School Boards Association (NSBA) for their strong support for public education. Alexandria, Va. (Jan. 31, 2014) - The National School Boards Association (NSBA) is honoring the Massachusetts Association of School Committees (MASC) for a project that has helped Massachusetts school boards improve teaching and learning in their districts. MASC will be awarded the 2014 Thomas A. Shannon Award for Excellence at NSBA's Leadership Conference in Washington on Feb. 2, 2014. Alexandria, Va. (Jan. 31, 2014) – Patricia Culler of the Illinois Association of School Boards (IASB) will receive the 2014 Thomas Shannon Award for Excellence from the National School Boards Association (NSBA). Culler will be honored at NSBA's Leadership Conference in Washington on Feb. 2, 2014. 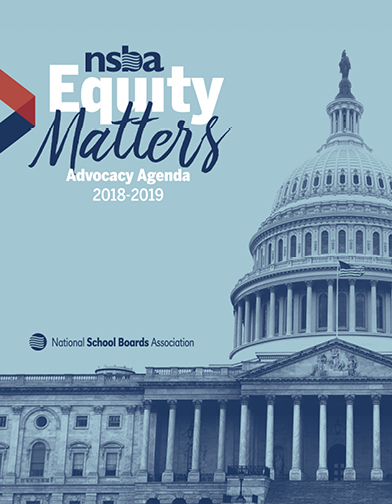 Alexandria, Va. (Jan. 28, 2014) – The National School Boards Association's (NSBA) Executive Director Thomas J. Gentzel issued the below statement following the 2014 State of the Union.